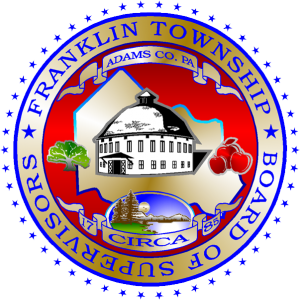 Franklin Township Board of Supervisors meeting will be held May 2, 2019 at 7:00 p.m. All are welcome to attend! Franklin Township Board of Supervisors Workshop will be held on May 16, 2019 at 7:00 p.m. All are welcome to attend! If you have any questions, please contact the Township office at 717-334-4901 ext. 100. DISTRICT 2 ARE DUE BY OCTOBER 31, 2019. Franklin Township is establishing an email list so important Township communications can be sent to Township residents via e-blasts or an e-newsletter. If you are interested in receiving these Township communications, please click the button below to sign up.